Last evening was one of those perfect mid-week evenings. Chris and I both made it home early enough to beat the heavy traffic and head to Annapolis for a tasting at a local wine wine store followed by roaming around the city and some dinner at the Red Red Wine Bar. One of our favorite wineries, Fess Parker, from St Olivos, California, was conducting a tasting at the Mills Fine Wine & Spirits and that is what caused us to sojourn to Annpapolis for the second time in two weeks. Coming to the completion of a perfect evening, a bit cool, but nice; we decided to get an ice cream cone as the perfect topper on the evening before heading home. We should have known that it would not end well when it took three tries to actually find an ice cream store that didn't smell bad. The first two that we tried both had off odors of heavy chemicals cleaners and it was just not conducive to selecting and then eating ice cream. The third store, Kilwin's, had a nice sweet smell and seemed fine. We selected our ice cream and walked outside to enjoy the evening and stroll back to our parked car when tragedy struck. As Chris went to enjoy the first lick of her cone, the top fell off onto the street--not ten steps outside theater. Visions of small screaming children immediately came to mind--but, being an adult Chris handled it admirably. She returned to the store for a replacement leaving me to guard the fallen ice cream so that no one accidentally stepped into the pile and potentially injured themselves. We tried to find a dog to clean up the mess, to no avail. A small bird happened by briefly--but was not really interested. When Chris returned with her replacement scoop, I used some napkins and removed the fallen scoop to a nearby trash can, ending the crisis. 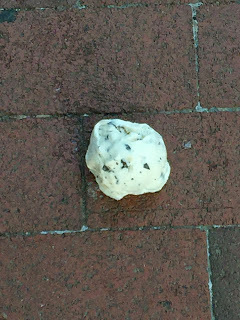 I chuckled to myself remembering the old adage about not crying over spilled milk--and thought it was good we didn't cry over fallen ice cream.